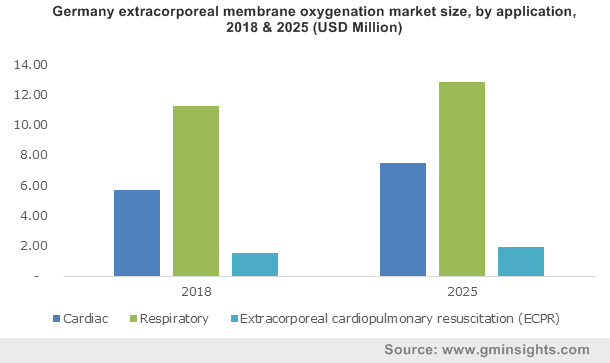 Extracorporeal Membrane Oxygenation Market size valued over USD 275 million in 2017 and is estimated to witness more than 3.5% CAGR from 2018 to 2024. 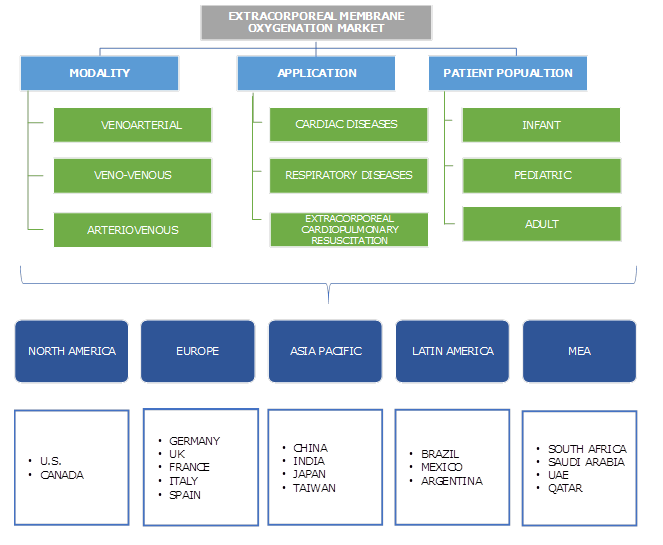 Increase in prevalence of cardiopulmonary diseases and respiratory failure in Asia Pacific region influenced by several diverse socio-economic and environmental factors will augment the growth of extracorporeal membrane oxygenation market. Respiratory diseases pose several different challenges to healthcare systems worldwide and are main contributors to morbidity and mortality in Asia Pacific region. Increase in tobacco smoking and infection (including tuberculosis), are the major cause of respiratory diseases and deaths in Asia Pacific, fuelling the industry growth. Recent technological advancements in extracorporeal membrane oxygenation (ECMO) in North America, intent to use for paediatric and neonatal cardiac and/or respiratory failure will boost the devices sales in near future. Rise in number of total R&D activities in the past few years coupled with significant technological advances have resulted in enhanced ECMO survival rate. These new technologies and their impact on increasing utilization of ECMO in diverse patient population will drive the industry growth over the projection years. Extracorporeal membrane oxygenation (ECMO) is life saving procedure for the patients with extreme cardiac or pulmonary failure, but high cost of equipment will be one of the major market impeding factors. Only specialized healthcare centres provide ECMO and hence, the patients with low and middle income or affordability issues finds it unaffordable; therefore, impeding the industry growth. Venoarterial (VA) modality accounted for majority of market with a value of USD 124.6 million in 2017. Recent technological advancement in mechanical circulation has resulted in quality and survival of increasing number of patients suffering from advanced heart failure and other cardiopulmonary disorders. Increase in use of veno-arterial (VA) ECMO in patients with several aetiology of cardiogenic shock will drive the demand for venoarterial ECMO. Veno-venous ECMO (VV-ECMO) modality is estimated to witness considerable growth in the projection period at a CAGR of 3.3%. It is the treatment of choice for the patients with conventional medical treatments and for patients with respiratory failure and optimal mechanical ventilation. Though veno-venous ECMO is complex technique and poses substantial risks, it provides complete respiratory support for the patients increasing the survival rate. Aforementioned factors will be responsible for the business growth in the future. ECMO application in respiratory diseases held the majority of market share, accounting for around USD 168.8 million in 2017. According to World Health Organization, more than 3 million people die each year from chronic obstructive pulmonary disease (COPD), accounting for over 6% of the total global deaths. ECMO has exceptionally progressed in the last few years and has become an invaluable tool in the care of patients with respiratory disorders. Increase in use of ECMO in treatment of children and adults with severe respiratory diseases will propel the industry growth in upcoming years. Application of ECMO cardiac disease segment will witness substantial growth at a CAGR of 4.8% in the forecast timeframe. According to recent survey, rise in use of ECMO essential for mechanical circulation support in the patients suffering from severe cardiac problems. Increase in use of ECMO in treatment of cardiac diseases such as congenital heart disease, cardiomyopathy, myocarditis, and other cardiac disorders coupled with coupled with technological advances in treatment of cardiac diseases will have tremendous impact on the extracorporeal membrane oxygenation market growth. Use of ECMO in infant patient population generated majority of revenue in 2017, accounting for over USD 122.0 million. Around 1% of newly born babies in U.S. suffer from most common type of heart defect being ventricular septal defect (VSD). According to Clinical Guidelines Committee, ECMO is a proven treatment for severe cardiac and respiratory failure in neonates that improves long term survival in the infants up to 80%-90%. Thus, increasing use of ECMO in infant will drive industry growth in upcoming future. Adult patient population subjected to ECMO use will witness significant growth at a CAGR of 4.6% from 2018 to 2024. ECMO has been widely used in treatment of both cardiac and respiratory failure and is invaluable and viable therapy for adults. According to Johns Hopkins Health System, heart disease is the most serious health problem in U.S., with an estimated 15 million adults suffering coronary heart disease. Hence, increase in adult patients with severe cardiac and respiratory failure introduced to ECMO early in the course of diseases will boost the market growth. U.S. dominated North America ECMO market with a value of USD 94.9 million in 2017. According to American Lung Association, Chronic Obstructive Pulmonary Disease (COPD) is the third leading cause of death in the Unites states, with more than 11 million people diagnosed with COPD. Ongoing technological advancements leading to production of superior ECMO devices and increase in number of people suffering from cardiac and respiratory disorders will lead to U.S. retaining higher market share over the forecast timeframe. China ECMO market is forecast to witness a robust expansion, growing a CAGR of nearly 6% during to forecast timeframe, owing to increase in number of patients suffering from cardiovascular failure and increase in awareness among the country population regarding ECMO application. Almost 100 million people suffer from Chronic obstructive pulmonary disease (COPD) in China, generating ample amount of market growth opportunities in the near future. Some of the leading players include Getinge, Medtronic, Terumo, Abbott, LivaNova, and Alung Technologies. These companies have focused on strategic decisions in order to develop technological advanced ECMO devices. Also, Merger and acquisitions have lead the companies to increase their operational capabilities and survive in the market by providing better products to the customers. Increase in the number of people suffering from cardiac and respiratory failure will augment the growth of extracorporeal membrane oxygenation market in the forthcoming years. Increasing government initiatives and growing demand for emergency life saving devices such as ECMO are major factors that will support the industry growth. Also, enormous investments in research and development to develop technological advanced devices will further boost the market growth.